In its upgrade to Version 8.1, the Siemens Industry Automation Division has equipped its Simatic PCS 7 process control system with 70 technical innovations. These will improve user-friendliness, performance and efficiency of the process control system from Siemens throughout the entire lifecycle of process engineering plants, from planning to maintenance. Configuration engineers benefit from more efficient engineering tools, operating personnel from enhanced convenience in their daily work, and operating companies from higher plant availability and lower total operating costs. Two examples of more efficient engineering with Simatic PCS 7 V8.1 are selective loading of programme codes and the “Type Change in Run” functionality. When selectively loading programme codes into the automation systems, configuration engineers can now specifically load their individual changes. This eliminates the coordination work otherwise required within the project team, therefore making commissioning more flexible and considerably more efficient. With the new Simatic PCS 7 CPU 410, “Type Change in Run” also affords engineering enhancements, ie updates of individual blocks can now be loaded without having to set the automation system to “stop”. This is an advantage in the event of version updates in the opera-ting phase, for example when expanding the functionality of an existing motor block. Advanced Process Graphics provides greater ease of operation, cutting the daily workload of operating teams. Previously available as an optional module, and included in the control system’s standard variant as from Version 8.1, the visualisation contained in Advanced Process Graphics focuses on consistent use of discreet colours, simple shapes and unambiguous symbol language in the operating screens. Processed plant data in the form of hybrid displays, trend curves and spider diagrams simplify the work of the operators. Important trends in production processes are displayed and overall relationships are reliably visualised. With increasing complexity and extended classical operator control tasks, this facilitates the daily work of operators. The system expansion card (SEC) for the Simatic PCS 7 CPU 410, the new MPC 10x10 block and new condition monitoring blocks, for example, stand for higher availability, boosted performance and lower overall operating costs with Simatic PCS 7 V8.1. With the system expansion card for Simatic PCS 7 CPU 410, the controller’s performance is adjusted exactly to the respective automation task. Without restarting the automation system, users can increase the number of process objects with additionally required performance, for example. There is no need to plan for safety reserves and companies operating the systems save on investment costs. As a model-based predictive controller, the new MPC 10x10 block can control up to ten manipulated variables and controlled variables. 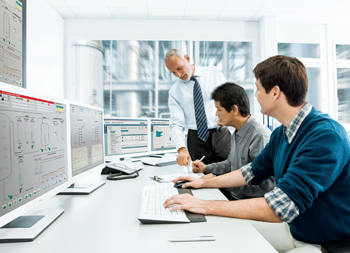 With it, sophisticated multi-variable control tasks and even higher-grade control tasks can be implemented with ease, for example operating whole distillation columns with maximum product yield and use of energy. The new condition monitoring blocks in Upgrade V8.1 monitor mechanical components such as pumps or valves for correct operation. Condition monitoring concepts can therefore be integrated directly into the control system with a uniform look and feel. Thus, operating companies gain valuable information about the condition of their plants, avoid unscheduled outages, and additionally save on energy costs through monitoring and optimum operation of their components. Gulf Industry, published by Al Hilal Group has now established itself as a "must-read" publication for anyone with an involvement in the region's industrial sector whether as manufacturers, distributors or related service organisations.The publication represents a "window" into the Gulf's manufacturing trading and export sectors providing news, views analysis and information across virtually every industry related sector.